Friends of Judge Theresa Whelan hasn't added a story. 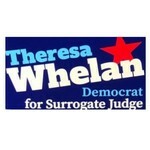 I am seeking your support to elect Judge Theresa Whelan to the Suffolk County Surrogate Court. Simply put, Judge Whelan is one of the finest candidates for this position and eminently qualified based on her lifetime of experience and record of integrity. In Judge Whelan's ten years on the bench as a Family Court Judge, she has distinguished herself, rising to supervising judge. In contrast, her opponent has never served on the bench and has no supervisory experience. It is critical that the voters understand the difference between Judge Whelan's experience and her opponent's lack thereof. Based on your understanding of the need for qualified judges, I would appreciate your financial support for the campaign. Please contribute to her campaign today. Friends of Judge Theresa Whelan hasn't posted any updates yet. Friends of Judge Theresa Whelan is managing the funds for this campaign.